Would you like a trick to make lasagna in just 12 minutes’ hands-on time? Classic lasagna takes me almost an hour to get into the pan. I love this cheaters’ method so much I might never go back to the old way! I love these kinds of recipes: yummy, healthy, and quick. See my suggestions at the end of the recipe for ways to make this lightning fast! Would You Believe this Is a Diet Recipe? It looks too good and tastes too wonderful to be a diet recipe. At 397 calories a serving and 22 grams of protein per serving, I think this is one great diet recipe! Nobody will guess that it’s so healthy. It has all the goodness of classic lasagna. Per serving: 397 calories, 22 grams protein, 42.6 g carbs, 14.7 g fat (if made with pork sausage). We used chicken sausage so the fat is even lower. If you can find ground beef that’s lower in fat and/or if you drain the fat after browning it, the calories and fat content will go down even more. Spray a large skillet with cooking spray. You really do need a large skillet. Add sausage, beef, and garlic. Cook 4 minutes breaking up the meat. Add marinara sauce to skillet and cook over low heat until it starts to simmer. Add frozen ravioli to skillet and stir to combine. Spray cooking spray on an 9-inch square baking dish that is broiler safe. I used an 9″ x 13″ pan and that worked too. It just changes the thickness somewhat. 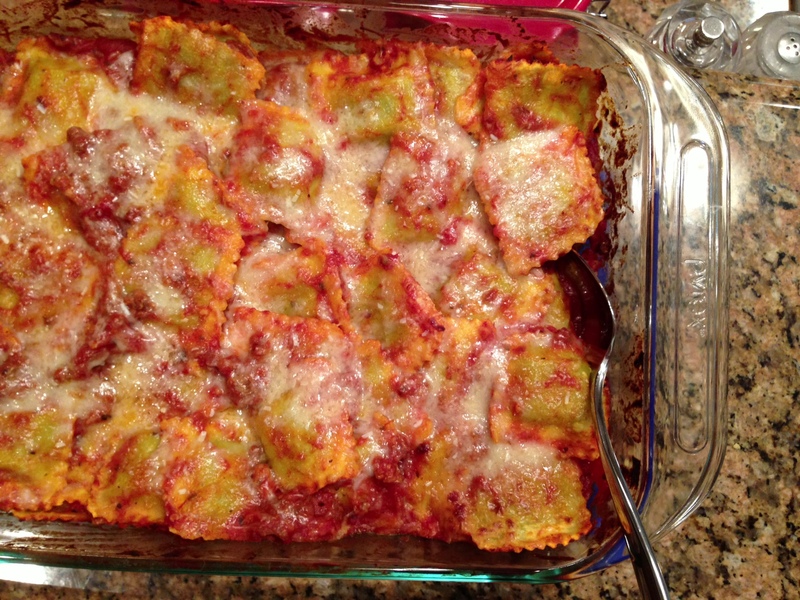 Spoon/pour ravioli and sauce into baking dish. Take out of oven and take off foil. Put the baking dish under the broiler for about 3 minutes until the cheese is bubbly and lightly browned. This is supposed to serve 6, but it could be more like 4 depending on how hungry your eaters are and what else you are serving. It’s definitely a great dish for entertaining and would be wonderful with a green salad and some red wine. To make this even quicker, make the sauce ahead of time. This combination of chicken sausage and ground beef could be cooked together with the garlic and then frozen in portions that you’d use most often when making pasta. It would be nice to just pull out a pack of the cooked mixture to add to a jar of sauce for a super quick meal that is actually pretty healthy. You could even just boil up some ravioli or other pasta and serve with the sauce. It’s not in the lasagna form, but it’s still healthy and yummy! I’ll definitely be making this during the holidays when time is short and I want a wonderful meal for visiting extended family. You have me chuckling, Roberta! Go full fat or go home? It’ll be great no matter how you make it. I love how quickly it goes together. It really is convenience food. And I could not resist it for lunch the next day too. I’m going to have to make it again very soon because I keep craving it. Enjoy, my friend! Have always shied away from Lasagna because of the time.